If we've learned anything about the tragic-sounding Rhesus monkey experiments of American psychologist, Harry Harlow (circa 1950), we know that baby monkeys love soft towels, especially in light of the absence of a loving, maternal figure and while we certainly do not advocate the loss of such a figure, we have to acknowledge the power of a soft item, for which a baby can cling to when Mother is not close by. Even if she is, we have learned that baby loves a soft towel and really, who doesn't? I do. 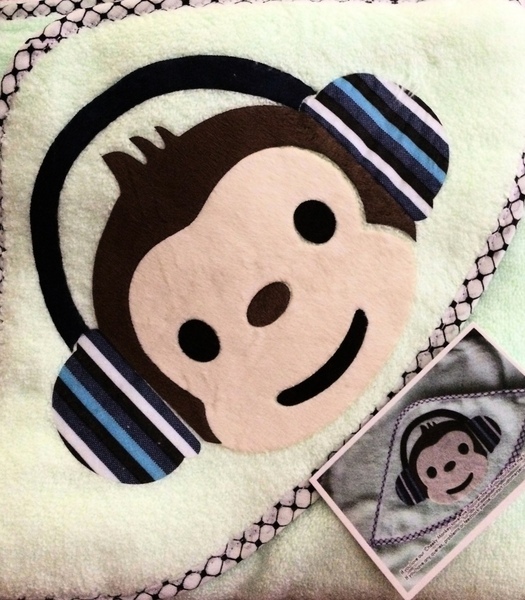 The monkey face applique is beautiful, whimsical and well done. 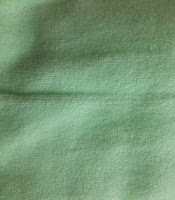 The towel itself is also beautiful and aesthetically pleasing. While the Ginae Reviews monkey photo doesn't do the towel justice, the towel is actually a lovely, green in color. However, it is also slightly flawed, as in loose strings here and there. There aren't many of them. But, they are there nonetheless present. It is good to make a note here that these products are covered with a 100% satisfaction money back guarantee. The stitching around the edges is perfectly done. The towel is super-soft. I cannot imagine an infant not loving this thing!